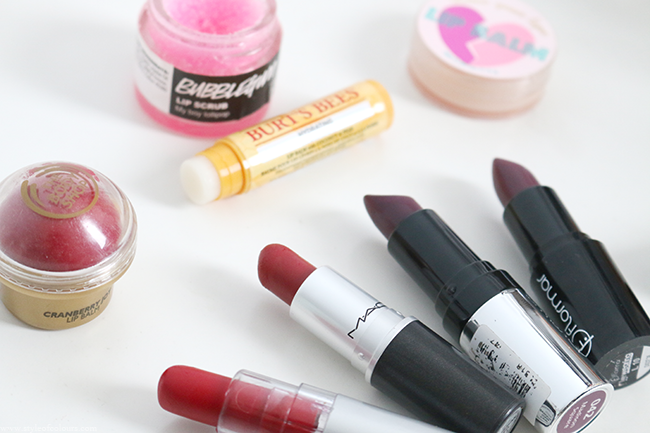 Lip products are one of my favourite types of makeup. My everyday makeup is usually basic: foundation and brows are done, a bit of brown eyeshadow in my crease and a dab of mascara. Which is why I feel like adding a bit of colour by using a lipstick makes a huge difference. 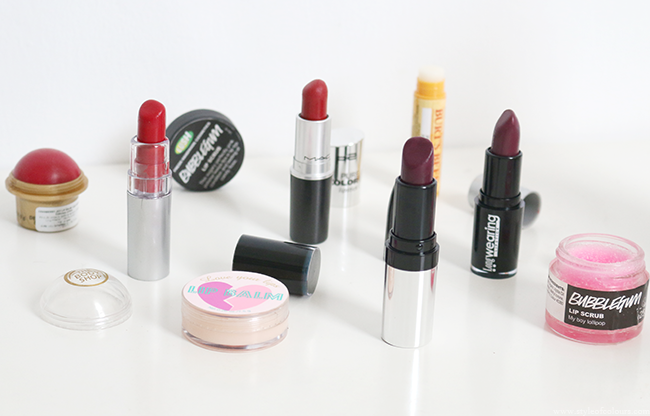 Sometimes I opt for neutrals but in the evenings, I'm all about the bold lip. I thought I'd share some of the products I have been reaching for this winter. I use lipbalms all year round, but in the winter, it is even more important to use them as the weather is cold and drying. So if you do not want to have chapped lips, you better have one of these with you at all time. I've got so many that I find the easiest way to be sure I have one with me is to stick one in each of the bags I use the most. I also tend to have one or two at the office. This winter, I've been using the H&M Love your lips lip balm in Rasberry Smile, the Body Shop Cranberry Joy lip balm and the Burts Bees lip balm with Coconut and Pear. The Burts Bees is my favourite at the moment as it is so moisturizing. Even with constantly applying lipbalm, sometimes my lips still get dry. Applying lipstick on dry, chapped lips is not pretty. Honestly, if I can't get them smooth then I'd prefer not to use a lipstick at all or I'll use a neutral one so it isn't noticeable. But, to get them from dry, chapped and peeling to pretty plumn and smooth I like to use the lush lip scrub. I currently have the bubblegum version because I love everything that smells like bubblegum. If you're not keen on spending so much on this product, you can always make your own with honey and brown sugar. Let me know if this is something you find interesting and I'll work on a DIY post. The MAC Russian Red is my all time favourite party lipstick. If I'm going out at night in the winter, you can bet I'm probably wearing this. It is such a pretty shade of red and lasts forever which means I don't have to worry about touching up while I throw back my glasses of mojito. The ELF Fearless is another red lipstick I have been using. The colour is great, it applies smoothly and is well pigmented, but the stay isn't very good. So I'd rather use this during the day so I can reapply whenever I need. These look very similar in colour and if hubs knew I owned them both he'd probably ask why on earth. And to be honest, he is probably right. Both these lipsticks have amazing staying power which makes them great for evenings out. I even had a friend ask me what lipstick I was wearing on a night out with the P2 Madison Square. She was extremely surprised when I told her it's a drugstore brand. 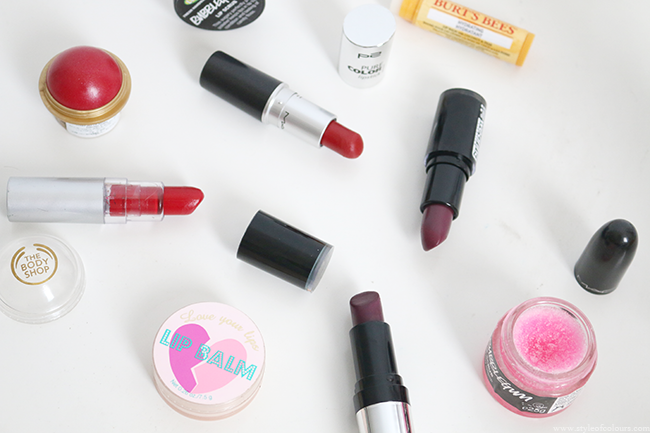 What's your go to lipstick in the winter months?